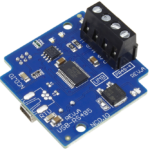 This 24-Channel USB relay board has a modular USB interface, compatible with Digi XBee modules, as well as Ethernet, Wifi, Bluetooth, RS-232 and other communication options. This video shows the UXP expansion port, with the ability to monitor high-resolution 12-Bit Analog to Digital Converters, Contact Closure Inputs, and Potentiometer Outputs. 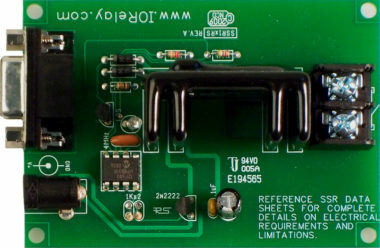 This controller is expandable to control more relays. 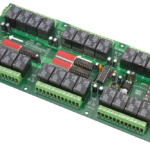 This ProXR Industrial relay controller is capable of switching 24 on-board SPDT relays, each with 5 or 10 Amps of current, customized at the time of ordering. Each SPDT relay includes 3 screw terminals for normally open, common, and normally closed contact closure relay output connectivity. 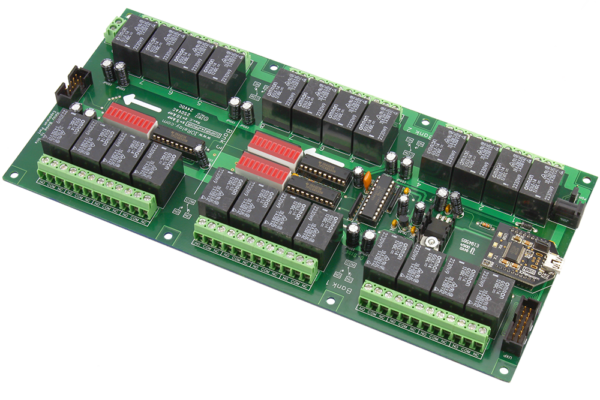 This controller features a modular communications interface, capable of accepting USB, RS-232, Ethernet, WiFi, Bluetooth, Industrial Wireless communication modules, and more. 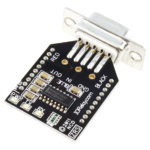 The on-board UXP expansion port makes it easy to add external expansion hardware to this controller. 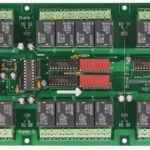 Expansion options include 12-Bit Analog to Digital Converters, Contact Closure Inputs, or Digital Potentiometer outputs. 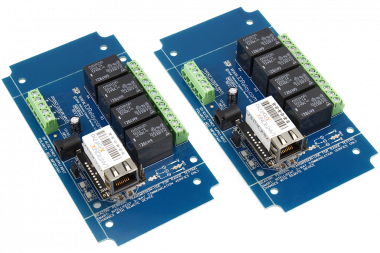 Expand ProXR controllers to switch more relays of various types using the XR Expansion Port. Simply plug in any XR Expansion Relay Controller and you are ready to switch solid state relays, DPDT signal relays, general purpose SPDT relays, and high-power relays. 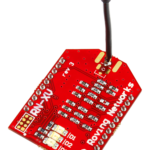 The firmware we designed for ProXR series controllers is ultra-stable. Our CPU uses hardware interrupts to manage communications while processing a wide range of background tasks, such as 16 relay timers, 16 relay flashers, data parsing, and garbage cleanup. ProXR controllers will never “drop” commands, even in the most demanding environments. We use a hardware watchdog timer, built into our CPU. The watchdog timer acts as a supervisor, capable of rebooting the CPU should anything go wrong so you never loose communications. The current CPU is more powerful, more feature packed, and more stable than any other controller on the market. 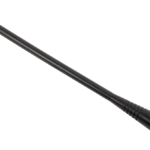 ProXR controllers were designed to operate non-stop 24/7 from 0 to 85C. 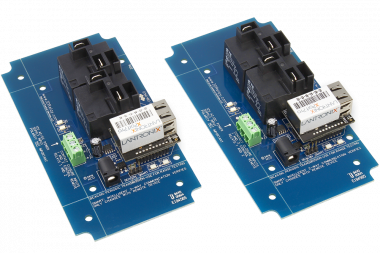 ProXR controllers can take control of relays in ways you may have never imagined. Of course you can turn relays on, or off, or toggle the current state of the relays. 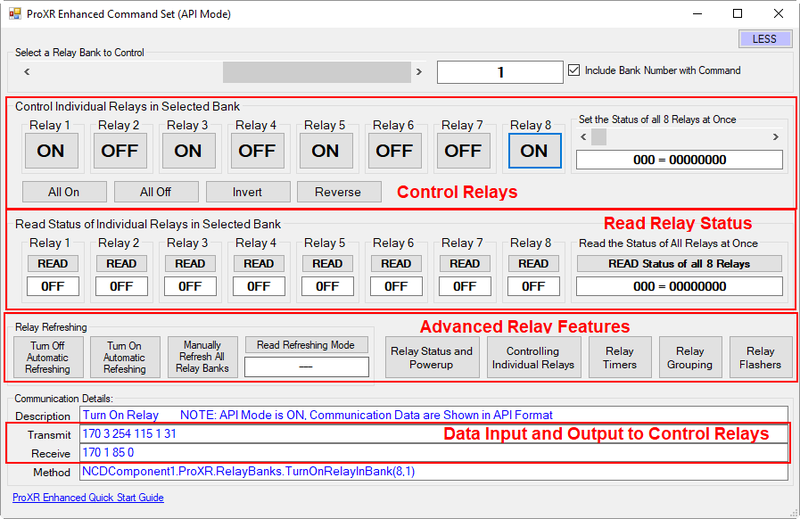 It’s also easy to read the status of individual relays, relay banks, or all relays on the controller. These are basic functions every relay controller should support. ProXR relay controllers have many features you may not expect. For instance, ProXR controllers support 16 timers that run in the background. Each timer can activate a relay for up to 255 Hours, 255 Minutes, and 255 seconds when activated. Activate 16 security lights using the timers and watch them all turn off at different times. ProXR controllers also support 16 flashers, allowing up to 16 relays to be automatically cycle on and off in the background until the flasher is canceled. 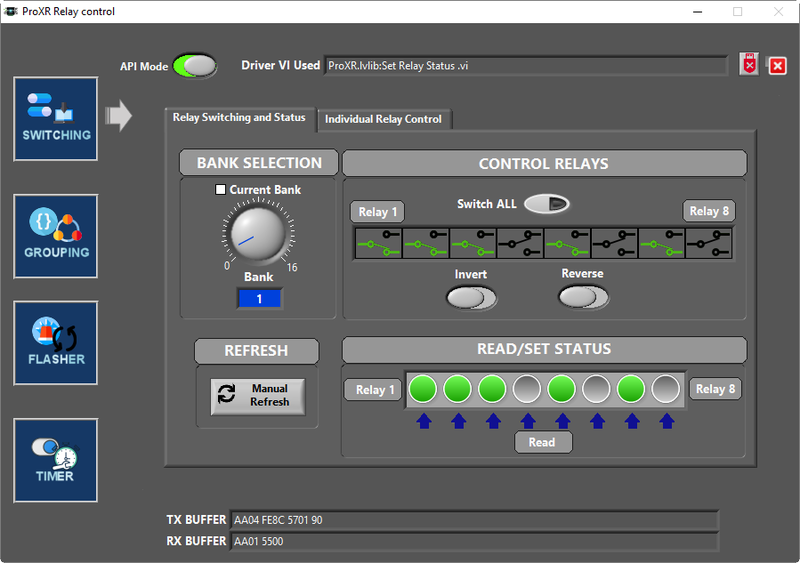 Relay grouping commands allow ProXR controllers to simulate large expensive relays using low-cost relays. 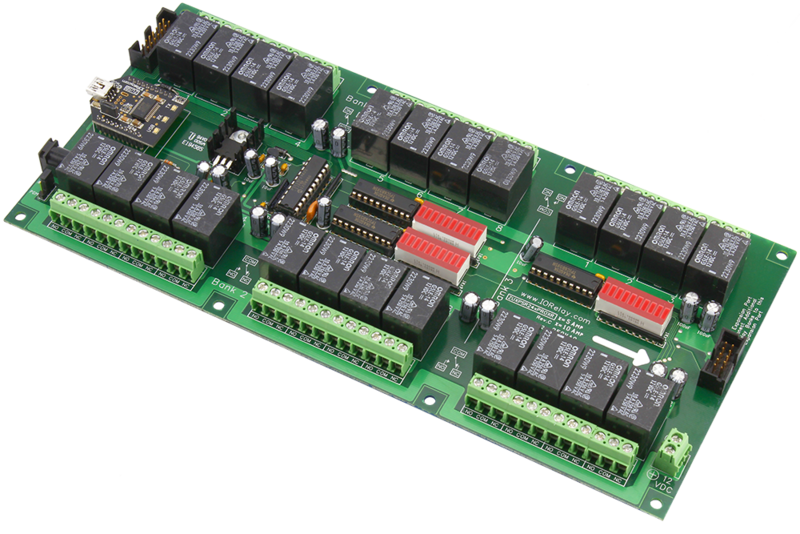 Grouping commands are used to activate a master relay plus a few of it’s neighbors simultaneously, allowing simulation of DPDT, 3PDT, 4PDT, 5PDT, 6PDT, 7PDT, and 8PDT relays using a low-cost 8-Channel SPDT relay controller. By default, ProXR controllers automatically update the status of relays every time you send a command. This feature may be enable or disabled. When disable, users have the ability to configure the relay memory without actually switching relays. Once all the memory is configured, simply send the Relay Refresh command and all relays will refresh simultaneously. This is particularly useful in applications that may require you to configure the on/off state of each relay and switch all relays at the exact same time. ProXR will remember your refresh settings every time it powers up. And while we are on the subject of power-up, ProXR relay controllers do not click when power is first applied. This alone is one of the biggest reasons industry has chosen ProXR over the competition. ProXR relay controllers are equipped with a XR Relay Expansion Port. 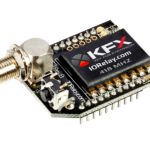 The XR Port allows you to add more relays to your controller as your needs expands. 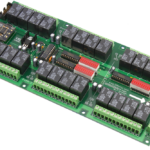 Combine mechanical and solid-state relay expansion controllers in any combination to accomplish your automation requirements. 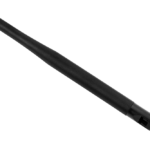 We manufacture SPST, SPDT, and DPDT expansion solutions, available in 4, 8, 16, 24, and 32 channel versions. 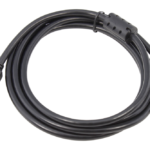 ProXR relay controllers support up to 256 relays in firmware; however, expanding over 128 relays may not be possible if the cable length is too long. There’s a lot of little things we did to make ProXR special. We created Base Station Software so you can learn to use ProXR controllers using a Windows 8 or 10 PC. 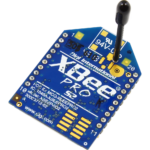 Base Station supports all communication technologies and teaches you what bytes to send to your controller so you don’t have to hunt down the manual every time you want to use a new function. Simply copy and paste the communication bytes from the Base Station User Interface into your favorite programming language. 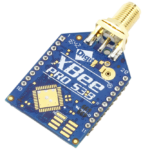 Base Station will demonstrate the engineering behind ProXR series controllers, but if you want a preview, just take a look at the ProXR Quick Start Guide in the Resources section. On-line videos walk you through all the major features. ProXR controllers have a 5 year warranty and a operational life expectancy exceeding 10 years. We built ProXR controllers to last. 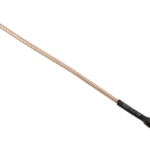 We are committed to up-gradable hardware, not disposable hardware. 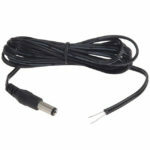 We use the best relays, the best communication technologies, and we have the best support in the industry. We can help you with all of your relay control needs, no matter how complex! We are pleased to announce that official LabVIEW relay control drivers will be supported beginning January of 2018. 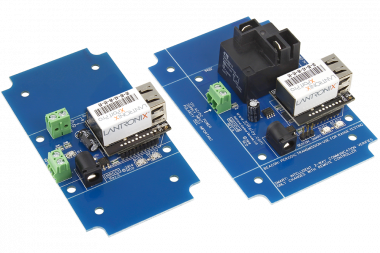 This is our first official release of LabVIEW drivers for ProXR series Relay controllers! We are finalizing the drivers and resources now. We will post in the News section as well as the Learn section of our site as soon as we are ready. This controller is equipped with a on-board UXP Universal Expansion port. The UXP port allows users to connect expansion controllers to this device, greatly enhancing the hardware features of this controller. There are essentially 3 types of expansions that may be connected to ProXR UXP series controllers. 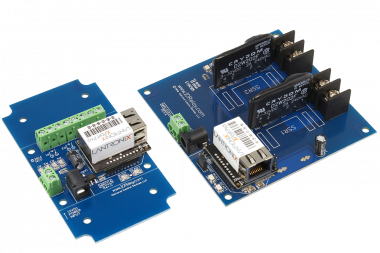 While it is not possible to mix expansion modules, multiple expansions of the same type are supported by UXP series controllers. 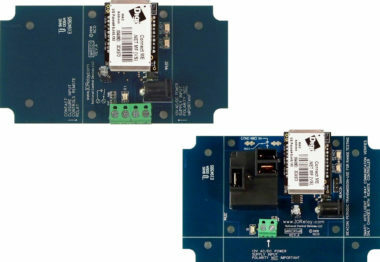 The 16-Channel 12-Bit ADC expansion module allows users to connect 16 analog sensors from 0 to 5VDC to the UXP expansion port for accurate measurement. 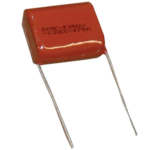 With 12-Bit resolution, analog voltages are converted into integer values from 0 to 4095. 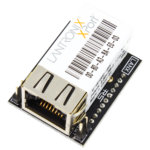 Up to 3 of these expansions may be connected to a single UXP Expansion port, allowing up to 48 Channels of analog sensors to connect to your ProXR relay controller. 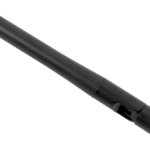 Connect buttons, switches, magnetic door sensors, pressure switches, current detection switches and much more to the contact closure input UXP expansion. Expansion boards are available in 16, 32, and 48-Channel versions. Mix and match any version up to a total of 2,048 contact closure inputs to your UXP series series relay controller. Contact Closure inputs are queried in your software, simply ask the controller for on/off status of any input bank (a bank represents 8 contact closure inputs), and the controller returns a byte, indicating the on/off status of 8 inputs at a time. Connect this 16-Channel potentiometer output expansion to your UXP ProXR controller and take control of 16 digital potentiometers at 8-bit resolution per channel. Choose between 10K, 50K, or 100K potentiometers. Mix and match potentiometer expansions up to a total of 256 potentiometer outputs. Digital potentiometers are capable providing a resistance output for each channel within the 0-5VDC voltage range. 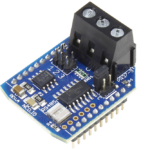 Potentiometer outputs are capable of safely handling up to 1ma of current per channel. 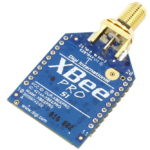 Base Station Software was designed to help you learn the ProXR command set. Explore ProXR features using our Graphical User Interface. Watch data bytes flow to and from the board, so you easily understand the command execution process. There is no faster or easier way to learn how to automate than Base Station, as it was designed to work with our complete array of communication modules, including Wireless, Ethernet, USB, RS-232, and many more. You only need a Windows 8 or 10 Computer to Run Base Station. Base Station was written in Visual Studio, and we even provide the source code to help you on your way! We take communications seriously, as we believe in a modular communications and firmware that properly supports scalability into future interface technologies. 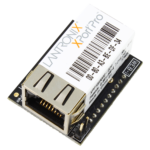 ProXR controllers support API communications, which effectively wrap every command with a header, payload, and checksum to ensure reliability. NCD API commands increase processing speed because no serial timeout is required prior to command processing. NCD API commands increase reliability, as only a proper checksum will authenticate a command and allow it to process. When we first implemented API, internet communications via a TCP/IP socket could be realized because the timing problems of internet communications were eliminated. While API is optional, it is strongly advised. Our Base Station software uses API communications, so it’s possible to control a ProXR controller over the internet after configuring port forwarding on your router. 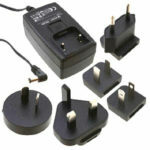 ProXR series controllers are the world’s most adaptable controllers, capable of communicating with a wide variety of communication options. 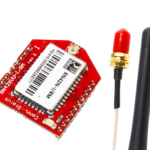 Pick any of your favorite communication technologies: Bluetooth, USB, WiFi, Ethernet, Ethernet Web-i WebRelay, 802.15.4 Wireless, ZigBee Mesh, Key Fob, or RS-232. ProXR easily adapts to the communication technologies you need most. We are committed to modular communications, so your ProXR series controllers can easily be retrofitted for other applications as your needs change. ProXR controllers are never obsolete, as we are actively releasing new communication technologies that greatly enhance the connectivity of our ProXR series controllers. NCD Controllers equipped with a Web-i WebRelay interface may be controlled from a built-in web page. 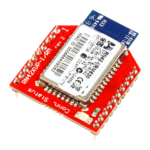 The NCD WebRelay interface module feature a Ethernet connection, allowing control of our devices from anywhere in the world using a web browser. This device is accessible via web page over a local area network. This device requires users to configure Port Forwarding on their local router for accessibility over the internet. Port Forwarding is outside the scope of NCD technical support, please visit https://portforward.com/, as this web site is dedicated to helping users configure their routers for port forwarding. Controlling Relays from a Computer using Windows 10 and a USB Relay Board. Turn Relays On and Off and read the status of relays. This video gives you a quick introduction to how Relay Control Commands work using Base Station as a reference. You can download Base Station at ncd.io/start. This video is a quick introduction to Base Station, available for FREE download at ncd.io/start. 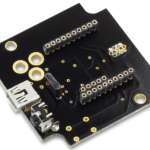 Base Station is a Free software download that can control any of our Industrial Series boards and give you a quick command reference. You can find the complete Base Station Quick Start Guide here: https://ncd.io/base-station-quick-start-guide/. This video demonstrates how to read the status of relays as well as setting the power-up default status of relays using ProXR relay controllers. 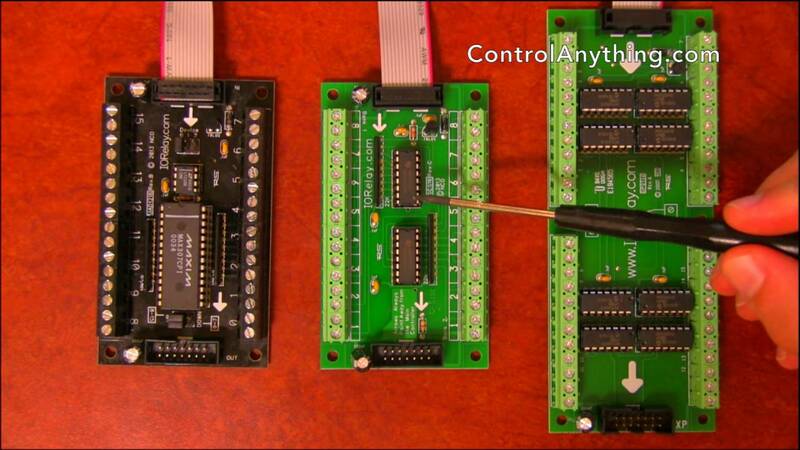 This video uses a 16-Channel USB relay board. Relay Power-up Status Mapping allows you to account for power loss to a Relay Controller. This video demonstrates controlling individual relays on a 16-Channel USB Relay Board. 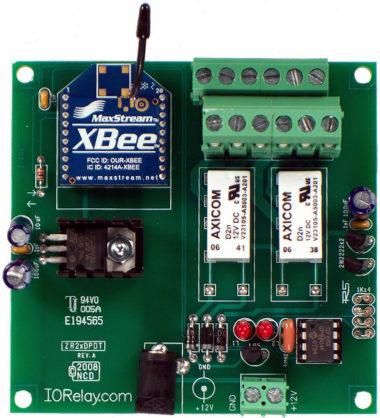 Controlling relay individually is the easiest way to control relays on your Relay Controller. It is ideal for applications with a single endpoint/pc controlling it and doesn't need to control multiple relays with one command. Automatic and Manual Relay Refreshing Modes Explained for users of ProXR Industrial Relay Controllers. This video shows a 16-Channel USB Relay board. Manual Relay Refreshing is useful if you need to only update Relay Status (On/Off) on interval. You can send relay control commands to the board and the changes won't become live until the manual refresh command is sent. This video demonstrates ProXR relay grouping commands using a 16-channel USB Relay Controller. Grouping commands are useful full to simulate DPDT Relays and for applications that require multiple relays to be triggered any time one relay is triggered. 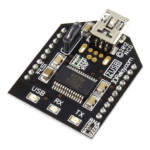 This video demonstrates ProXR relay flashing commands using a 16-channel USB Relay Board. 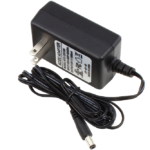 Relay flashing is ideal for signal operation, warning buzzers, and any other application that needs relays to be activated at regular intervals. 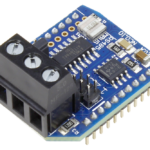 This video demonstrates ProXR relay timer commands using a 16-channel USB Relay Module. Relay Timers are a powerful tool in the ProXR command set. Turn a relay on or off for a pre-selected amount of time using a single command after the relay has been set up. This makes for a useful tool for pulsing relays, rebooting servers/computers, and many more application where a Relay only needs to be activated for a specific amount of time. Learn how to FTP and customize your Web-i Interface. If you want to make some changes to your Web-i interface and how it works you can follow the instructions on this video and be up and developing in minutes. Learn how to properly configure your Web-i. Learn how to alter the configuration of your Web-i to better suit your needs. Whether customizing macros, changing the UDP broadcast, or setting a static IP address or password this video will get you up and running. This video will show you the basics on how to get started familiarizing yourself and using the Web-i Interface. This software used to find your Web-i Controller has changed. 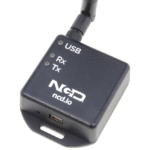 You can now use NCD Base Station to find your Web-i Device. You can download Base Station at ncd.io/start. Get the rundown of the benefits and capabilities of using a Web-i in your next project. 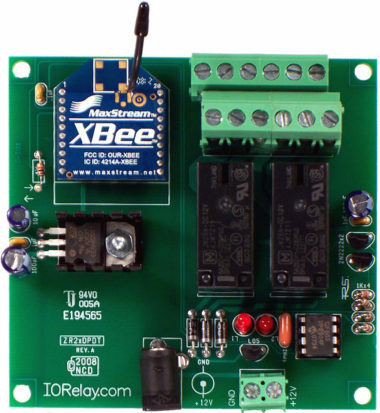 From relay control to sensor monitoring Web-i gives you an easy to use interface for your web controlled relays. 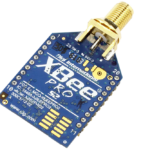 Get a basic introduction to both our XR Relay Expansion and UXP IO Expansion Boards. 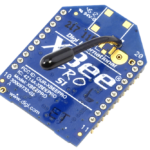 XR Expansion Boards provide additional Relays to your ProXR controller while UXP Expansion Boards provide additional functionality like ADCs and Digital IOs. 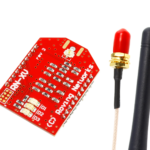 ProXR controllers are designed to work with a wide variety of communication modules. Change modules as your application needs change using the options shown below. Please note that your controller will be shipped without a communications module installed if you do not make a selection below. N-Button software allows you to configure buttons and widgets to control relays and read the status of relays without programming. Use N-Button to configure simple automation tasks, read analog inputs, and more. Customize the user-interface with meters, buttons, and much more.